Nashville, Tenn. (Sept. 5, 2017) - Called "the most sung artist anywhere" by TIME Magazine, multi-platinum selling artist Chris Tomlin announces the "Chris Tomlin Christmas: Christmas Songs of Worship" tour. Unlike the arenas and large-scale venues of past tours often associated with Tomlin, "Chris Tomlin Christmas" will incorporate historic venues and an up-close and intimate night of worship with Chris Tomlin. Visiting ten cities throughout the month of December, "Chris Tomlin Christmas" will be a rare opportunity for the audience to engage with Tomlin on a personal level, experiencing the spirit and joy of the season in some of the most beautiful venues in the country. 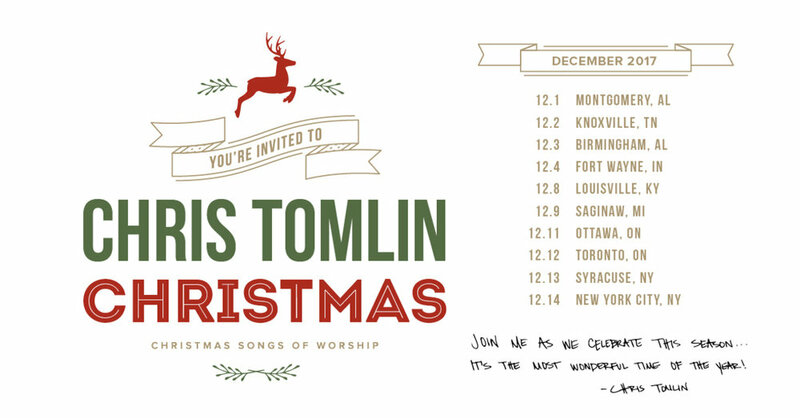 “This is going to be an incredible night, an intimate night of remembering what this season is about, remembering what Christmas is about, remembering why we celebrate and why we worship, and remembering our Savior together,” Tomlin says. Tickets available Friday, Sept. 15th at 12pm local time at ChrisTomlin.com. For the latest information visit christomlin.com.